all the little stories» Blog Archive » how to stay on top of everything. « recent scraps & favorite actions. I was recently inspired by this post of Kelly Rae Robert’s, where she shares a bit about her planners and notebooks. So, today I thought I’d share a sneak peek into my own little systems… because I love them! They are my lifelines. I use the blank spaces provided for each day in this calendar book like a mini to-do list for every day of the week. My little notes in here help me remember important weekly things (like sending out the newsletter every Wednesday for the Digichick shop), monthly specials or deadlines and smaller things I might otherwise forget (like checking on my three Facebook Fan Pages to update them with different things every now and again). And I absolutely love getting to cross things off these daily lists—that’s just one of the best feelings in the world, isn’t it?! I also keep a notebook for planning things at the Digichick (the red and pink striped composition book, which you can see behind the day planner here). Sometimes I find that I just need a place to make notes about upcoming plans and ideas for the store. 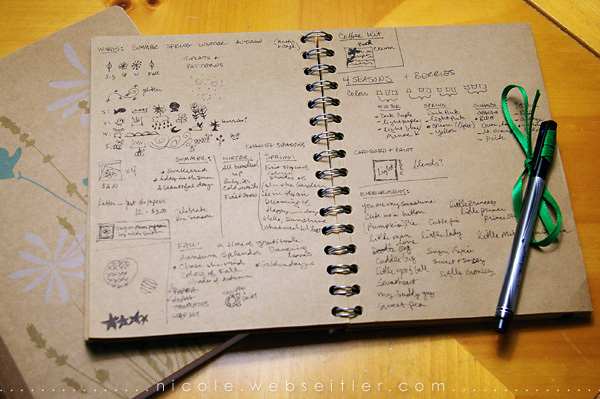 And I’ve discovered that this is best done in a bound notebook (so that nothing will get lost on me!). So I started using this comp book from the first day I took over things at TDC and it’s been a great help! I adore this little book—it’s so special to me! When I’m in the mood for coffee (which typically, I am; but oddly enough I’m not when I’m pregnant), I love to grab this sketchbook and find a cozy spot to doodle and make myself notes. I’ll draw out ideas for paper, elements, word art and alphas. Then when I’m ready, I’ll head to Photoshop. I learned a long time ago not to head to Photoshop before I’m ready! You can grow very frustrated, just sitting at the computer, if you’re not “in the zone.” And this is the best way for me to get in the zone! Drawing, doodling and making notes gets my creative juices flowing. It’s great! Here under my sketch book, you can see my new comp book that I just got! So pretty. I can’t wait to use this! It’s for my notes for the Digichick. We’re gearing up for a new season at TDC this October and I figure a new book should go along with that! 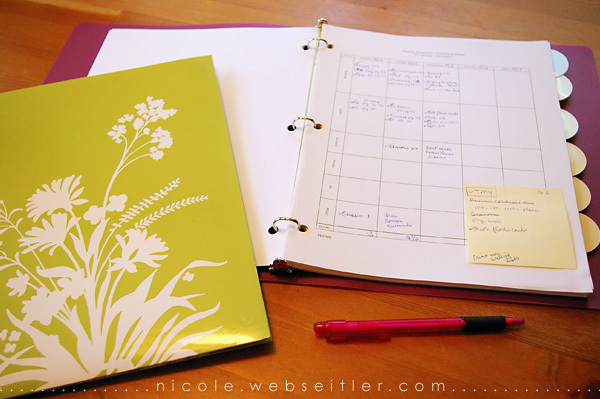 The other week, I asked some girlfriends for advice on a good homeschooling planner. I thought it would be so much easier to find what I needed, but I was surprised to find that I was wrong! There were very few options on the market for a good bound planner. I figured I might need to make my own. I ended up on Donna Young’s planner site and took a look through her forms. I was very excited to see that she not only offered dozens of .PDF files, but for many pages, she also offered .DOC files! That meant that I could download and edit these forms that she had created to suit my own needs. I was so excited! Don’t you love the spirit of sharing that some people have on the internet?! It’s the best. So, I spent an afternoon formatting fonts and widths and things and then sent it all off to Staples for printing! They even punched holes in everything for me. That was pretty awesome. I found a binder I liked and a set of those cool new re-positionable sticky tabs for my planner. In the front of the book, I have a list of the different resources we use and the abbreviations I’ve come up with for each book in my weekly notes. Then there’s a page for books we’ve read and educational videos we’ve watched. After that, there are the weekly sheets for notes of what exactly we’ve done. I found that it’s so much better for me if I don’t write down anything until we are actually doing it. 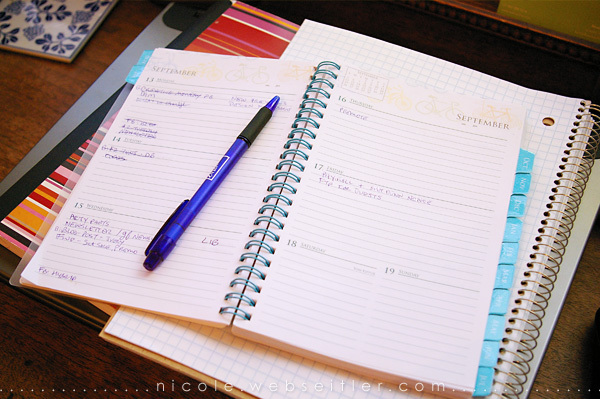 If I were to write out weeks and weeks of plans, it would get all messed up within two days. So, it’s better for me to make notes as we go. But, on the other hand, I don’t want to forget things we might need to review! So I started sticking a Post-It to my paper to make myself little notes for the week. And where you see the cute yellow tabs in my book, there is a yellow piece of cardstock that has a more formal “Goal Sheet” printed on it. Here I can make notes for bigger things I want to cover in the weeks to come. For example, this week the extra thing we are covering in math are Roman Numerals. But sometime in the next few weeks I have this idea to do an intro to geometrical shapes (like hexagons, octagons and nonagons) using a story book we love about a quiltmaker and some construction paper with which we’ll make quilt blocks! Doesn’t that sound like fun?! And so I have a place to make notes about all these sorts of “unit study” ideas that come to me in the middle of other studies, so I don’t forget them. Also seen here is my folder that holds stickers (because everybody loooooves stickers, right?) and various loose papers for future lessons. I like it ’cause it’s pretty. Now, what was I saying?! This entry was posted on Wednesday, September 15th, 2010 at 3:21 pm and is filed under homemaking, homeschooling, just life, sugarplum paperie, the digichick. You can follow any responses to this entry through the RSS 2.0 feed. You can skip to the end and leave a response. Pinging is currently not allowed. I do a lot of those same things! Particularly about not writing down school plans until we are just about to do them. I have a daily planner with school pages in the back. It’s bound and has daily bible readings listed and any special holy/saints days marked. I use those daily areas as a mini to-do check list, also. And, yes, crossing things off the list is the best! I sometimes joke that the first thing on my to-do list is “make to-do list” so that way I have something to cross off first thing! LOL. Thanks for sharing. I always wonder how People Like You (don’t take that personal – it’s a compliment, promise!) do it all!! And I love that you love what your doing and called it “sweet chaos”. thanks for sharing, your comments are thought provoking, I appreciate the “no sugar coating” too! I love your post. I was wondering what brand of sketchbook you use? Thanks!